We had planned for our closing to be in the middle of May so that we could have a couple of weeks to tackle the most pressing of problems (kitchen, hardwood floors) before moving in June 1. However, our closing was pushed back, so we ended up with only about a week to work on the house before loading up all our stuff and calling this new place home! Eager to get started, we rushed straight from the closing office to our new home and got to work! It was a Friday evening, and we still had to rip out carpet and scrape up linoleum tile before the hardwood floor refinishing guys could come in on Monday. We’ve already taken out the drawers in this picture, and if you look closely, you can see the edge of the radiator that was right under that sink. Our plan was to totally tear out the kitchen, remove the radiator (solve the heat problem later), and install all new cabinets and appliances. By this time, Catherine and I had already planned our new kitchen and placed an order for the cabinets and new refrigerator. All we had left to do was pick up the cabinets and install, but first, of course, we had to tear out the old. 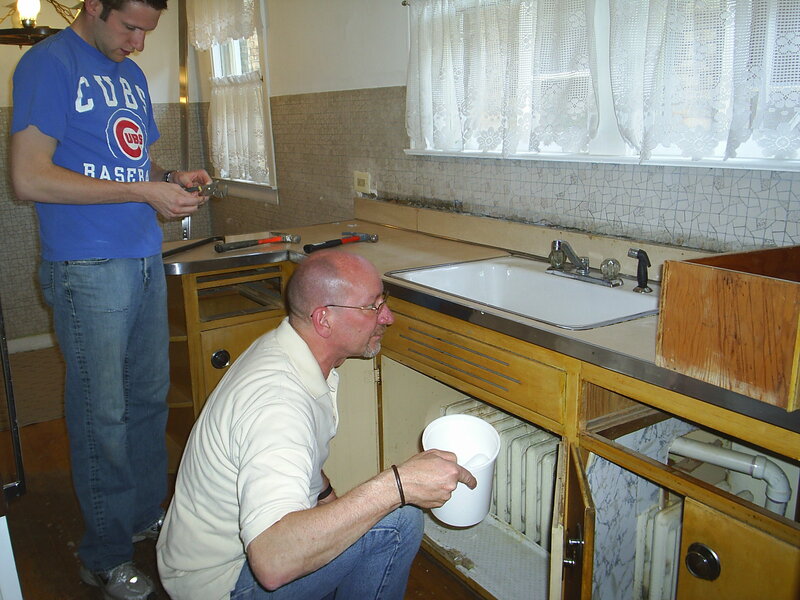 Here’s Bob and I deciding how to take out the heavy cast iron sink before tearing out the cabinets. Notice to the right of this picture the drainage pipe which had been rerouted through the side cabinet…like I said, completely unfunctional cabinets by this point. And here it is all torn out. Yes, that’s bare brick back there. Now you can see why we needed to move that radiator. With the cabinets out of the way, I started on removing the old built-in ironing board. A shame, I know. Those built in features are one of the great perks of craftsman style housing. 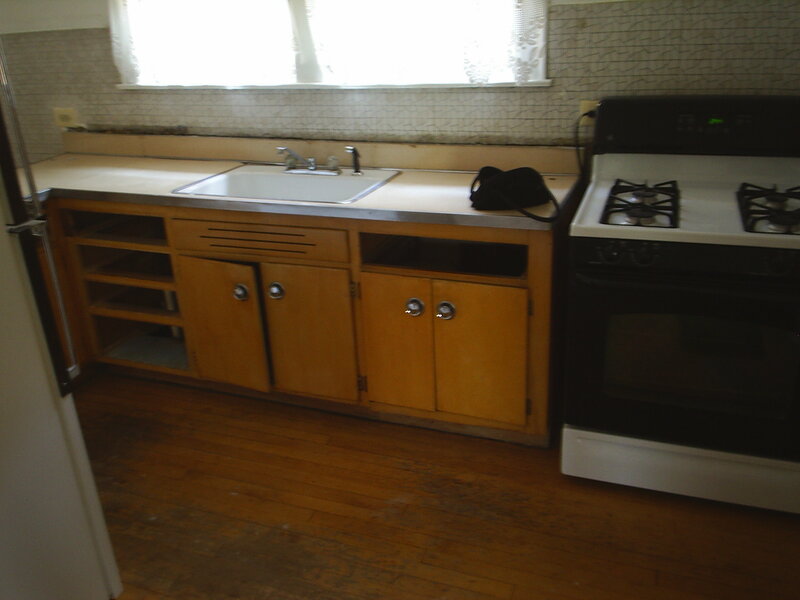 But, it had also apparently been built before the days of functional storage in a kitchen, so it had to go. Meanwhile, Catherine was still hard at work ripping out carpet and linoleum glued to hardwood under the back room’s brown shag. But, all good things must come to an end. At the end of our first day as homeowners, we had ripped the kitchen down to a blank slate and ripped up carpet to reveal hardwood floors with lots of potential. Much more to come! Can we still call it a “new” house? I’m not sure. We bought our house in May, 2009, and we’ve been so busy, we haven’t gotten around to updating anyone on all the work we’ve done on it. So, friends and family, consider this blog your official update. A little introduction to our house is in order, I think. We bought a 1931 typical Chicago Bungalow. 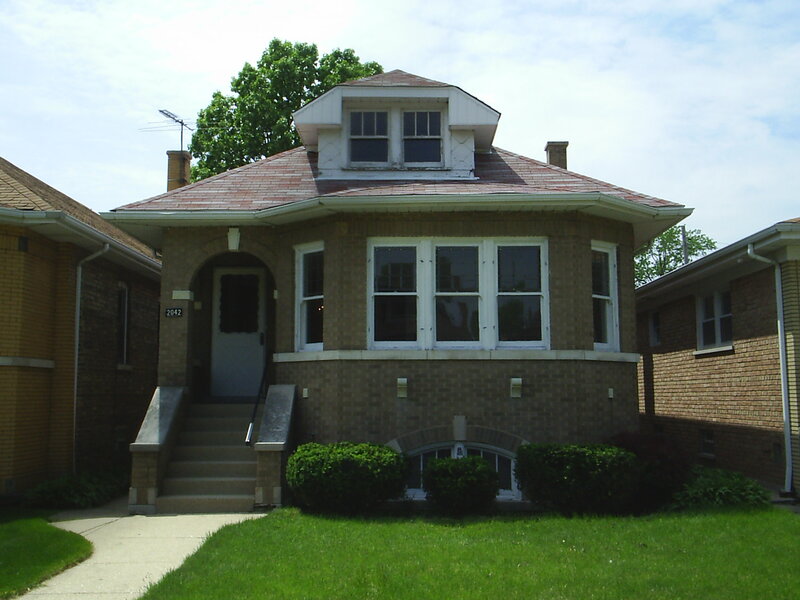 In the early to mid 1900s, a whole slew of bungalows were built throughout the city in what is now known as the Chicago Style (the gables and roofline are parallel to the street instead of perpendicular). Today, the city considers Chicago Bungalows to be worthy of preservation, so there’s (allegedly) a bit of money out there for anyone willing to rehab one. Growing up in my parents’ never-ending-project-of-a-house, I wasn’t afraid of getting my hands dirty, and Catherine…well, she just had a lot of confidence in me, I think! So, a bungalow became our primary search. Around March of 2009, we landed upon one in a new-to-us neighborhood of Chicago: Galewood. (Kim Novak grew up here). That’s where we found our current home – a charmingly unupdated bungalow. 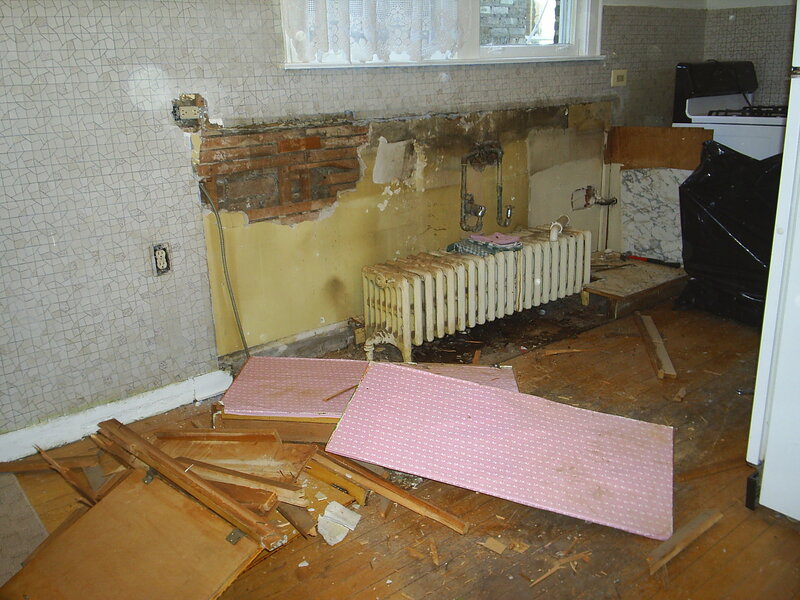 There was a lot of work to do, but we actually really liked that no one had attempted any previous renovation work. We had seen a lot of houses where homeowners had made “improvements” only to find they weren’t to our liking or not in keeping with the home’s architecture. So, in May, we finally closed on the place and took two weeks to get as much work done as possible before moving in on June 1. Here’s a glimpse of the house we saw when we first came for a viewing. This is our little home from the outside. We’ve since done some work, which we’ll show you later, but that’s pretty much how it looks today. This was one of the highlights and main selling points for us. This is the living room, just off the front entryway. Those leaded glass windows really got us! 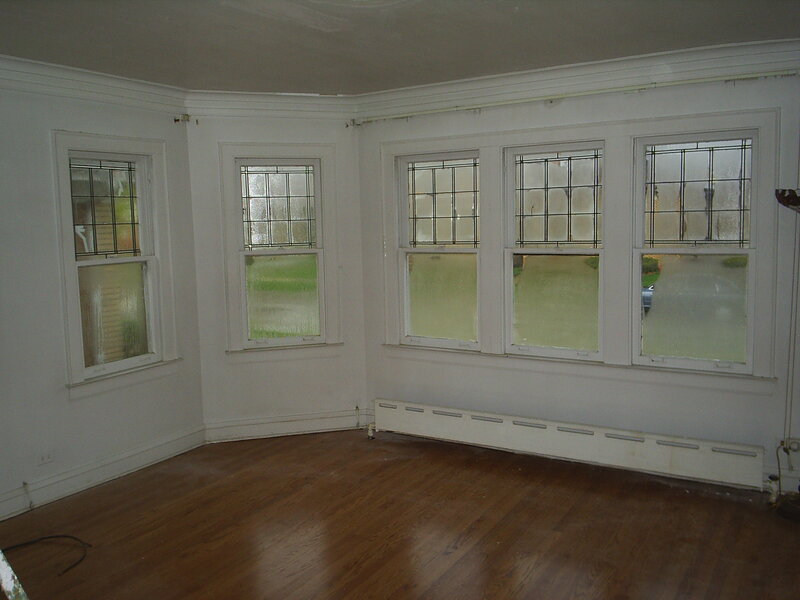 The floors in this room were in great shape, having recently been refinished. The floors elsewhere were a much different story, but seeing these gleaming hardwoods made us hopeful for the rest of the home. These two beauties were pretty representative of the state of the three bedrooms in the house. 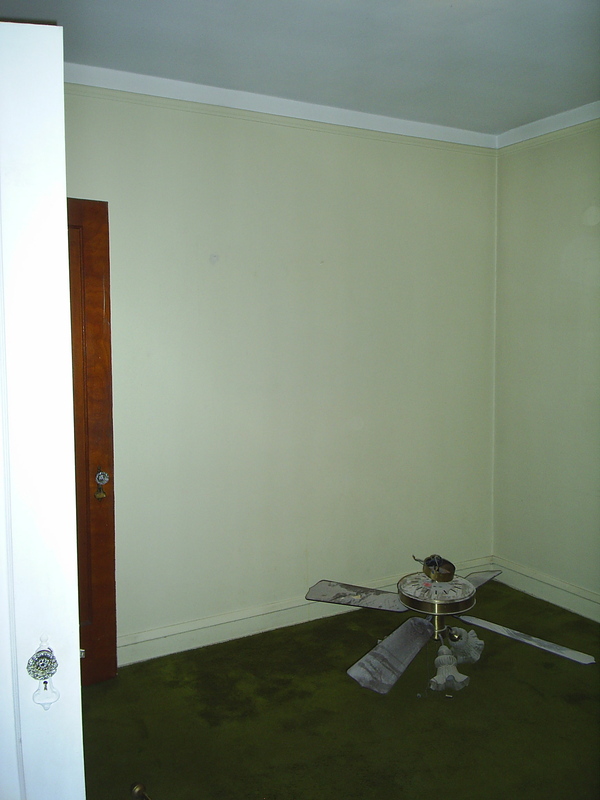 Green shag carpeting, dingy and damaged walls, outdated everything! 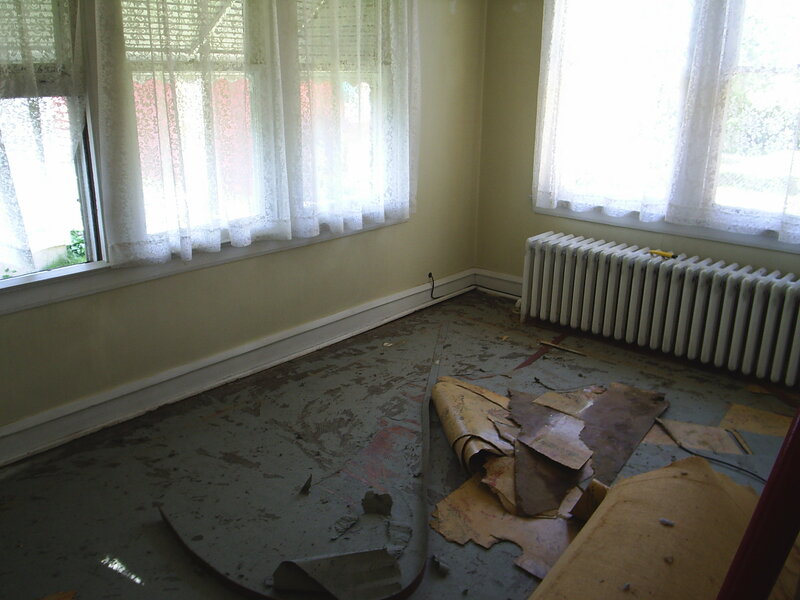 But, we pulled back a corner of carpet and were relieved to find old hardwood floors under there. It’s a good thing the kitchen isn’t the first room you enter when coming into the home, or I’m not sure we’d be here today. 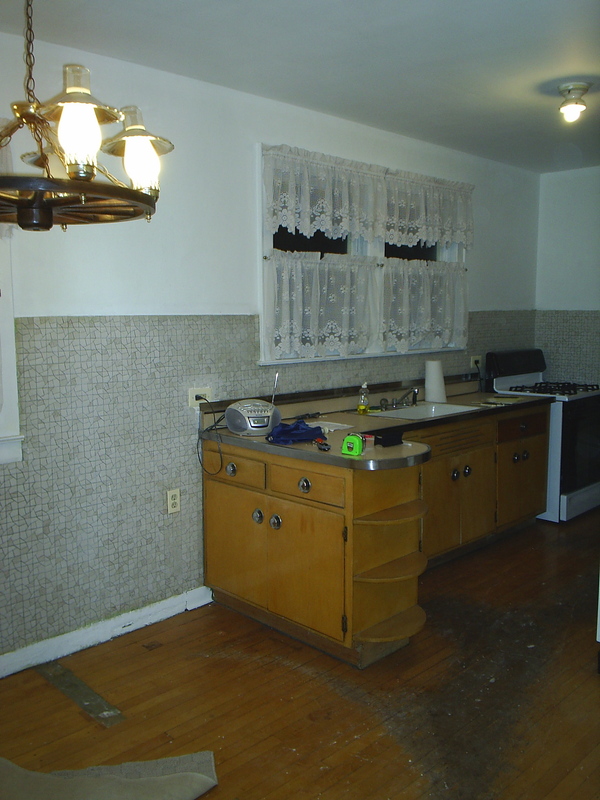 The top picture shows the east corner of the kitchen where the previous owners had torn out a wall that enclosed a pantry. We’re thankful for that, because it really opens the kitchen up, but they never got around to repairing the holes in the floor left from the previous wall. That small bank of cabinets is all the kitchen had to offer in the way of storage. 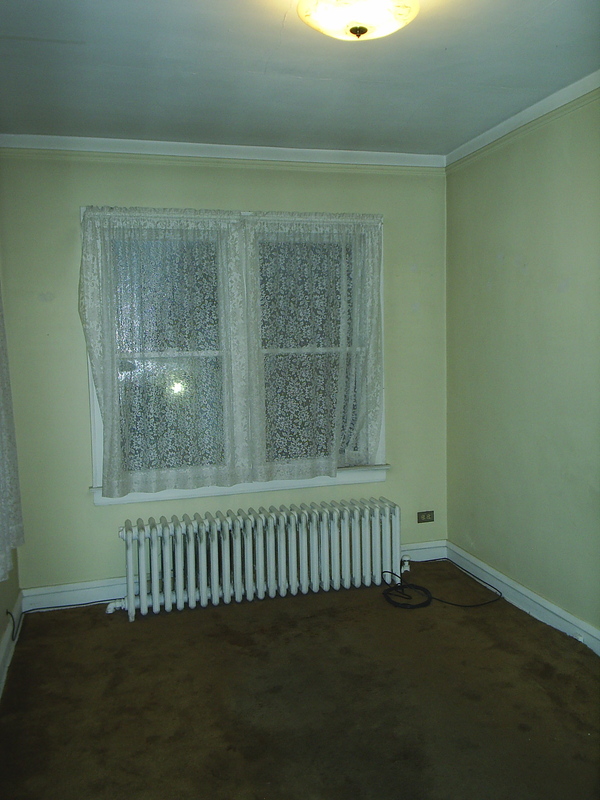 Plus, under the sink behind those double doors was a huge radiator. The cabinets (added sometime after the home was built, we’re guessing) had been built around the radiator, leaving them with only about six inches of storage space. The whole kitchen would have to be redone we knew, but what we didn’t know was how large of a task that would be. The pictures don’t show it too well, but the walls were also covered in a tan, blue, and metallic gold mosaic tile. 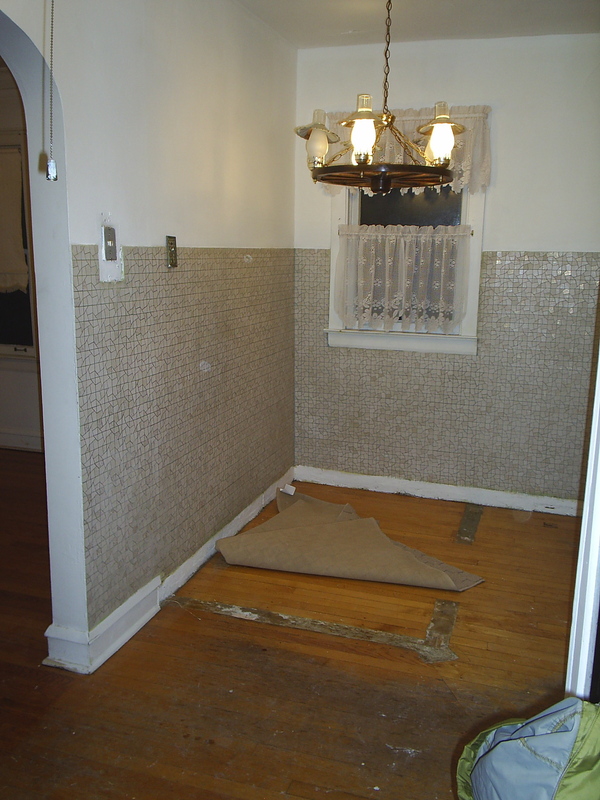 That tile was pretty popular – it later reappears in the downstairs bathroom. Finally, the maple floors were in terrible condition. A black path had been worn down in the wood straight through the middle of the room. And then there’s the bathroom. Oh, the bathroom! A large oak and cultured marble (read: plastic) vanity had been installed under a large matching medicine cabinet with attached light fixture. “Attached” is actually a loose term for “suspended by wire.” The tiled-in towel bar, hooks, toilet paper holder, and soap dishes were avocado green, and the cast iron bathtub had long ago lost its finish and showed a lot of rust. The basket weave tile floor was cracked and missing tile. 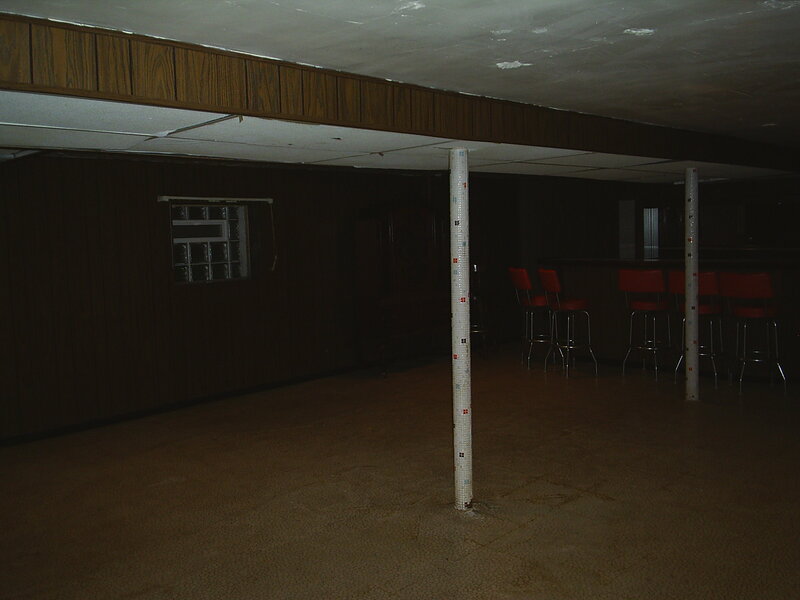 Finally, the basement. Sorry for the bad picture, but it’s all I have from that era. The basement was actually another selling point for me. It’s huge, spanning the entire length of the house. 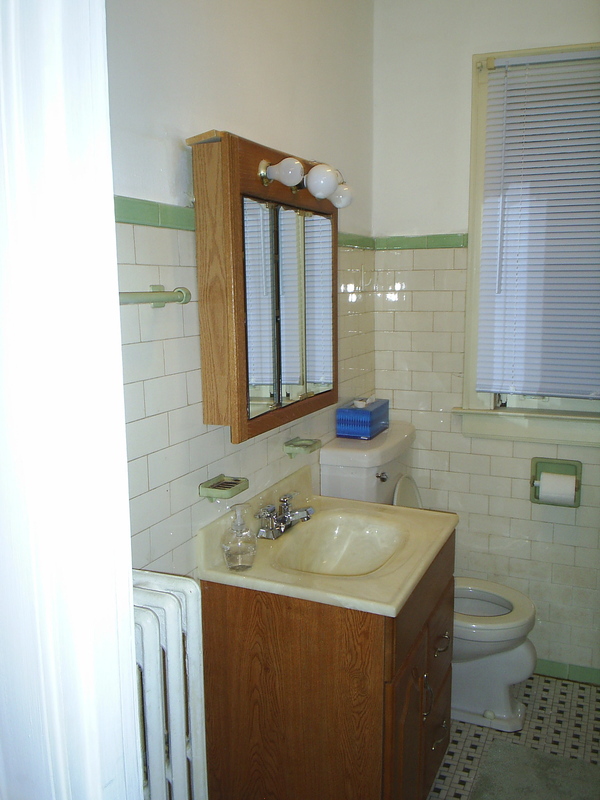 Sometime in the 70s, the previous owners had finished it, so there is the ubiquitous dark wood paneling, 70s tile floor, and some strange planter jutting from one wall filled only with pine bark. So, that’s a brief introduction to the place we finally fell in love with. There’s lots more to come, so stay tuned!